Apart from being the back bone of country’s economy, the largest city of Pakistan, Karachi undoubtedly has one of the best education system in country. There are a large number of well-recognized private and public education institutes in Karachi that are playing a vital role in the development of the new generation. You must check the schools list before the admission of your kids because school is the basic step in the education life of the children so must check that what type of school or institute will be good for their future. If you are looking for a school for your child’s best grooming, than take a look at our list of best schools in Karachi which is given below. Education Bay (EBAY) is undoubtedly one of the most well-recognized school of the city. It is situated Defense Housing Authority (DHA). The school has been providing quality education to children since its establishment in 1958. It is a coeducational institution located in khayaban-e-Hilal, DHA Phase VII. Established in 1847, Karachi Grammar School is an coeducational English-medium school located in Kheyaban-e-Saadi, Karachi. The school has expanded rapidly during recent years after growing from few hundred students to more than two thousand now. This coeducational institute provides education from nursery to O level. It was established in 1994 and has grown on a very impressive rate since than. Center For Advanced Studies (C.A.S) was established in 1981 and the school currently provides excellent education from O level to advance A level classes. 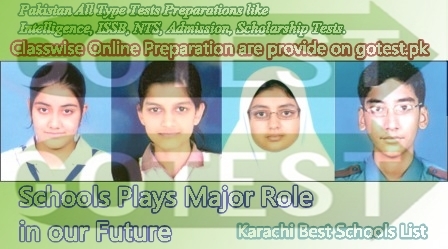 Along with these, there are also some other schools in Karachi that have a very good reputation and are certainly worth mentioning here. These schools include The Indus Academy, Beacon House School System, Education Center, The International School, Defense American School, The City School and Bay View High School Karachi.